Your job is to make yourself appear non-threatening. The first thing you want to do is move very slowly. Look before you move, look at where you place your feet, look at where your equipment is, and most of all plan where you are going to put the front of your lens. Many potentially good shots have been ruined by the front of a lens bumping a branch or leaf where an insect was resting, causing it to flee. Insects such as the housefly, the hornet, the butterfly, and the beetle, have what we call compound eyes. These eyes are made up of many separate units called ommatidia. Each ommatidium samples a small part of the visual field. Having multiple ommatidia allows the animal to easily detect motion. Some, like the dragonfly, have as many as thirty thousand units per eye, each with its own lens. 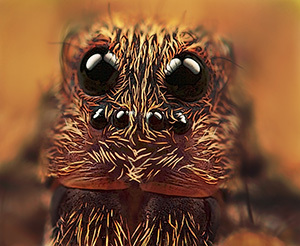 With a compound eye, the insect sees a mosaic image. This looks something like the highly magnified dots of a newspaper photograph. Because the lenses in the insect’s eyes have a fixed focus and can’t be adjusted for distance, insects see shapes very poorly. As an object moves across the visual field, ommatidia are progressively turned on and off. Because of the resulting “flicker effect,” insects respond far better to moving objects than stationary ones. Honeybees, for example, will visit wind-blown flowers more readily than still ones. 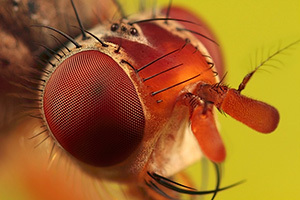 Houseflies and dragonflies have eyes that cover most of their head. This gives them almost 360 degree vision, enabling them to see predators coming from any direction. Most insects can see some color. While our eyes see a full spectrum of wavelengths from red to violet, many insects see a limited range of colors. The colors they detect are the ones most useful for finding food and shelter. It is known that insects, especially flying insects, will try to escape from a predator by a simple escape reflex based on the direction and the velocity of a moving shadow or object. If a critical velocity is exceeded, the insect will try to fly away from the direction of the threat. Slow moving objects or shadows often do not trigger this reflex. The lesson learned is that the best way to approach an insect is to move slowly and gently. Most of all, avoid casting your shadow on the insect. There’s still one more part of this series on insect micro photography, where Huub discusses how to compose your shots and ensure a sharp focus. Make sure you don’t miss it by signing up for our free weekly newsletter. You literally forgot the most well known tip for photographing insects… Always shoot in the morning when the air is chilled and insects have not had enough exposure to sunlight to raise their internal temperatures. This makes it much easier to get photos of them, and sometimes results in some really cool shots with dew if there happens to be any. If you cant shoot in the morning, you could also lower an insects temperature by temporarily placing them inside of a container and placing it in a refrigerator or cooler for a few minutes.